TUESDAY, March 3, 2015 (HealthDay News) -- The more fried food you eat, the greater your risk for heart failure, a new study says. "This study suggests that it might be wise to reduce the frequency and quantity of fried foods consumed weekly in order to prevent heart failure and other chronic conditions," said lead researcher Dr. Luc Djousse, an associate professor of medicine at Harvard Medical School in Boston. Heart failure means the heart isn't pumping blood throughout the body as well as it should. Symptoms include fatigue and shortness of breath, and it's one of the most common reasons for hospital admissions among people aged 65 and older, according to the American Heart Association. In this study, men who ate fried food one to three times a week had an average 18 percent increased risk of developing heart failure, researchers found. When fried food was eaten four to six times a week, heart failure risk was 25 percent higher, and at seven times or more weekly, 68 percent greater. So, ditch the French fries, doughnuts, crispy fried fish and chicken, and other foods cooked in fat, heart experts suggest. A healthy diet is high in fruits, vegetables, beans and whole grains, but low in saturated fat, red meat, salt and fried foods, Djousse said. The association between fried food consumption and heart failure risk seen in the study does not prove a cause-and-effect relationship. However, Samantha Heller, a senior clinical nutritionist at NYU Langone Medical Center in New York City, pointed out that greasier foods increase calorie consumption, which can lead to obesity, high blood pressure, high cholesterol, and heart disease. "In addition, people who eat a lot of fried foods may also consume a generally less healthy diet, consisting of more red and processed meats and fewer vegetables, beans and fruits," she said. "The bottom line is, eating fried foods once in a while is fine but not on a daily or even a weekly basis," Heller added. For the study, researchers collected data on more than 15,300 male doctors who took part in the Physicians' Health Study. The men -- average age 66 at the start of the study -- completed food frequency questionnaires over a three-year period. 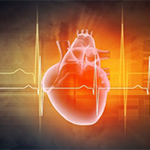 During an average follow-up of about a decade, 632 developed heart failure. Dr. Gregg Fonarow, a professor of cardiology at the University of California, Los Angeles, said the findings support previous research linking fried foods to type 2 diabetes, obesity and high blood pressure -- risk factors for heart failure. "This and prior studies suggest that lifestyle choices can influence the risk of subsequently developing heart failure," he said. "Heart failure is common, costly, and deadly," he added. The results of the study were scheduled for presentation Tuesday at an American Heart Association meeting in Baltimore. Data and conclusions of research presented at meetings are usually considered preliminary until published in a peer-reviewed medical journal. The U.S. National Heart, Lung, and Blood Institute funded the research.